Pat the shrimp dry with paper towel. Heat about half of the olive oil in a large saute pan. add half of the garlic and saute for a few seconds, then add the shrimp in one layer. Cook the for about a minute or so, and flip each one over with tongs. When done, pour into the pasta. Then add the second batch of shrimp and cook. Add those shrimp to the pasta, then deglaze the pan with the white wine. Scrape the bottom of the pan so all of the fond is removed (the brown tasty shrimp bits). Cook the wine for a few minutes to reduce a little, and add the cream is using. 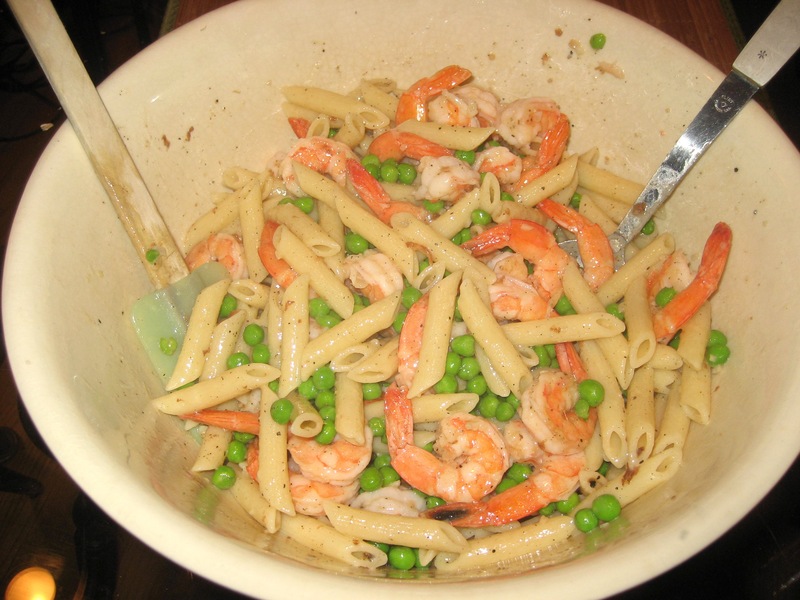 Then add the wine (and cream) to the pasta, peas, and shrimp. Add the lemon juice, and adjust the seasoning. Mix to combine the flavors. I like a lot of pepper and salt in this dish. Garnish with bacon and/or a little parm if using. Vegan Option: Omit the shrimp, and add a cup of little toasted pine nuts. Also saute 1-2 cans of artichoke hearts in the olive oil and garlic, white wine, and lemon. OK. This has been a political month for my food blog, so I figure it was time to bring the conversation back to food. 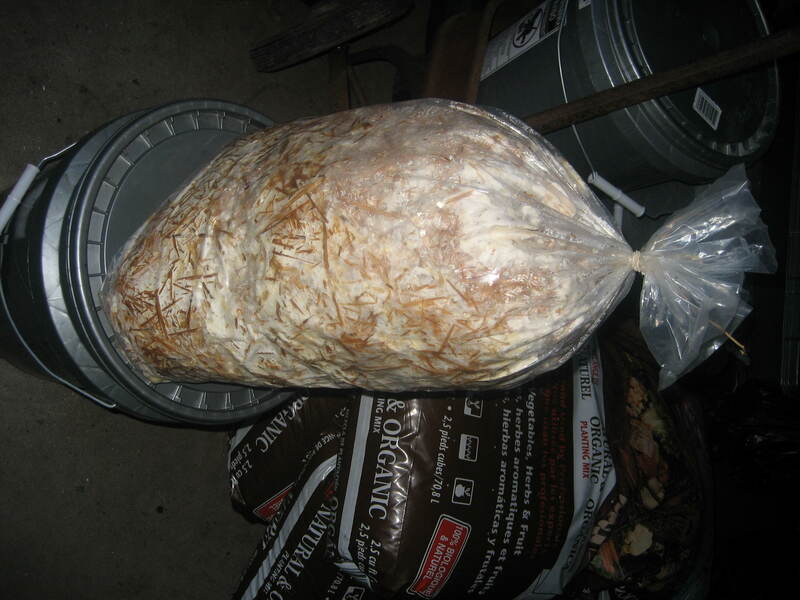 The picture above is oyster mushrooms growing out of a bag of straw in my garage. (See previous post) Just look at those beautiful mushrooms. I cannot take all of the credit, or much for that matter. I bought this bag at the Ann Arbor farmer’s market. It cost I believe $18. They said I should get three harvests about the same size as this. When they bag has exhausted this mushroom production, the straw makes great compost material. This is my third venture into growing mushrooms. No, I did not find any morels this year. 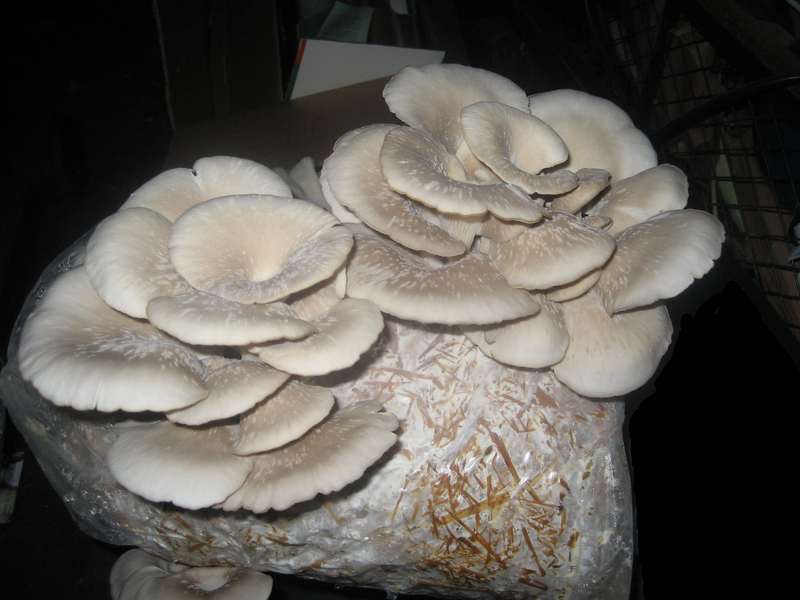 So what do you do with oyster mushrooms? Well, I suppose you can add to to any dish where a great flavor saute mushroom is welcomed. 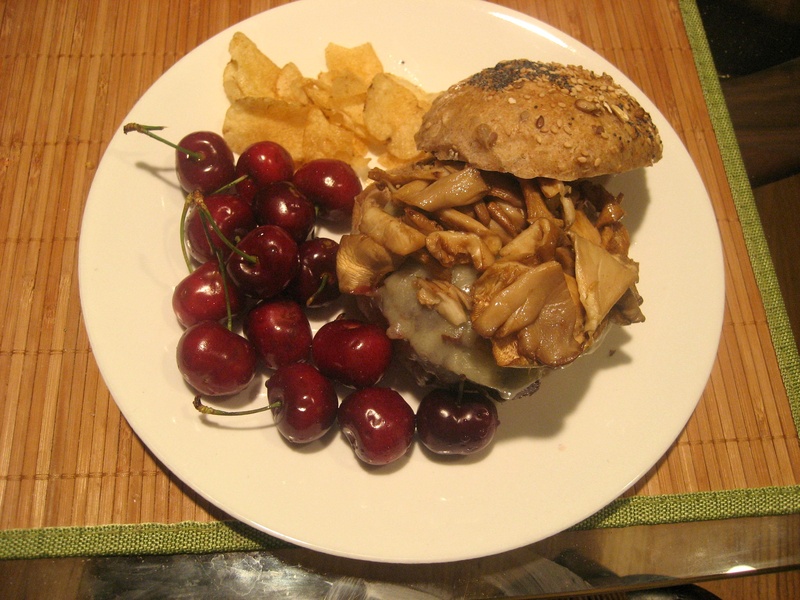 I simple saute them for a fancy mushroom cheddar burger, with cherries, and chips. 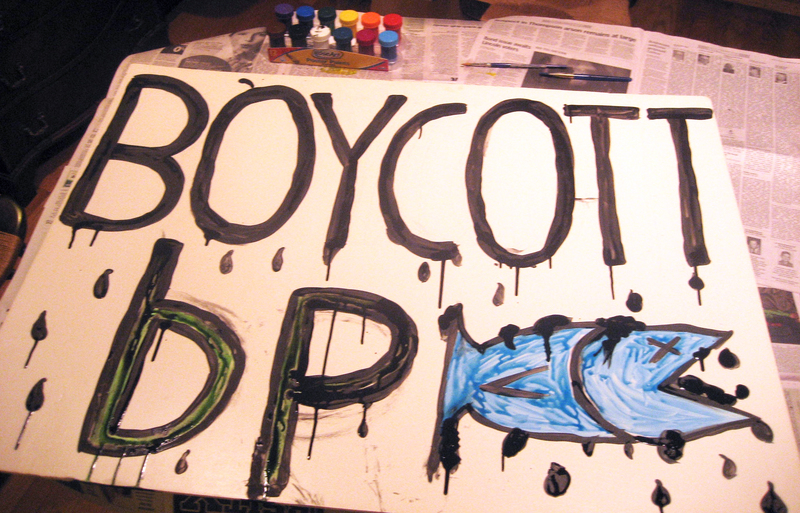 Today was my first day promoting a Boycott of BP in Ann Arbor. I positioned myself with sign in hand at the Ann Arbor maine street BP. I made sure to be on the side walk, and not on BP property, and I provided enough room for walkers to pass by. This way I was not doing anything illegal. Free speech rocks!!! In general the boycott protest went well. I was there for a little over an hour and recieived 103 either, honks, thumbs up, waves, cheers, woo hoos, or Damn Rights!. I figure some others might go some where else the next time they get gas. For every thumbs up, I figure there must have been 5 to 10 times as many people who saw the sign. And this was at a slow traffic time. I also had four people take a picture of me and my sign to I assume to show friends. He walk away before I could ask him if he was serious, but I could tell he was . I thought about it for a second, and realized the crazy logic. I mean if that was the case then why stop at simply getting your gas at BP to show your financial support? Why not send BP a charitable donation directly like one would say to the Sierra Club? Or why not ask your representatives to create a special BP tax to mandate our support right? We are talking about one of the richest, most profitable, most powerful company and industries in the world. They got that way by hiring an army of lobbyists, and having a “cozy’ relationship with the gov’t so they would look the other way with regulations and safety for decades. So, now that they screwed up, “we” the gas buying public, according to this guy, need to bail them out because they could not afford to clean up the spill without it? That is his argument, and it sound like the greatest public relation spin for BP of all time. BP has the money believe me. They had a record profit year before this happened, and have been doing great for years. Anyone remember the illogical gas price hikes during the last eight years? Another one yelled, “They [BP stations] are independently owned.” In other words, it is not Joe BP station owners’ fault. They just happened to be in bed with an evil parent company. For one, independent or not, they still benefited from Parent BP’s practices of cheap, unsafe oil extraction. So they also take the PR hit when the company screws up. I figure by boycotting BP stations, we affects BP’s and the independent station owner’s bottom line. This will get the independent BP station owners who have some pull, and probably are not too happy about the spill to go after their evil parent. The station owners who lose money from the boycott can also sue parent BP just like the share holders are doing for gross mismanagement which lead to a loss of stock share value, or customer at the pump. In fact, a boycott at the pump can nudge independent station owners to flex some muscle, and if these station owners are truly independent and against there evil parent company, they can always switch brands of gas they sell. Maybe they can hang their shingle with a company that is not responsible for the worse US environmental disaster in my life time. Maybe, just maybe BP’s action may lose them the right to do business in the US, then all of the independent station owners will need to shop around for a new supplier, more responsible supplier. As some of you may know, I am starting the Ann Arbor Sugar Beet Project. The idea is to create a local source of non-gmo beet sugar for Washtenaw County. The purpose for a gmo crops is to be resistant to herbicides, the most popular being roundup by monsanto. These crops are often referred as roundup ready. So with a gmo food you are getting a sprayed non-organic plant. If that is not enough, there has been a concerned that air pollinate crops like gmo beets can transfer their roundup ready traits to not only organic beets making them worthless to the organic consumer, but to also weeds. This in effect would create a super weed that is resistant to roundup. A farmer can spray all the round up they can, but the super weed will still be there. This logical fear has become a reality I am afraid. May I introduce the Giant Pigweed, our super weed. The video piece (Pigweed Story by ABC NEWS) shows this prolific crazy weed that is so strong that it can break heavy farm equipment. Monsanto, the company who created roundup throws the blame on the farmers saying they used too much roundup, which created the situation where the weed developed. Further comments from a company spokes person said that a fix would not be ready for seven years. Their argument makes little sense. The plant took on the resistant traits period, and then spread it to their friends. Entire fields are being abandoned where the weed is out of control, and heavy equipment is useless. In a 2009 article by France 24: “Palmer pigweed is the one pest you don’t want, it is so dominating,” says Culpepper. 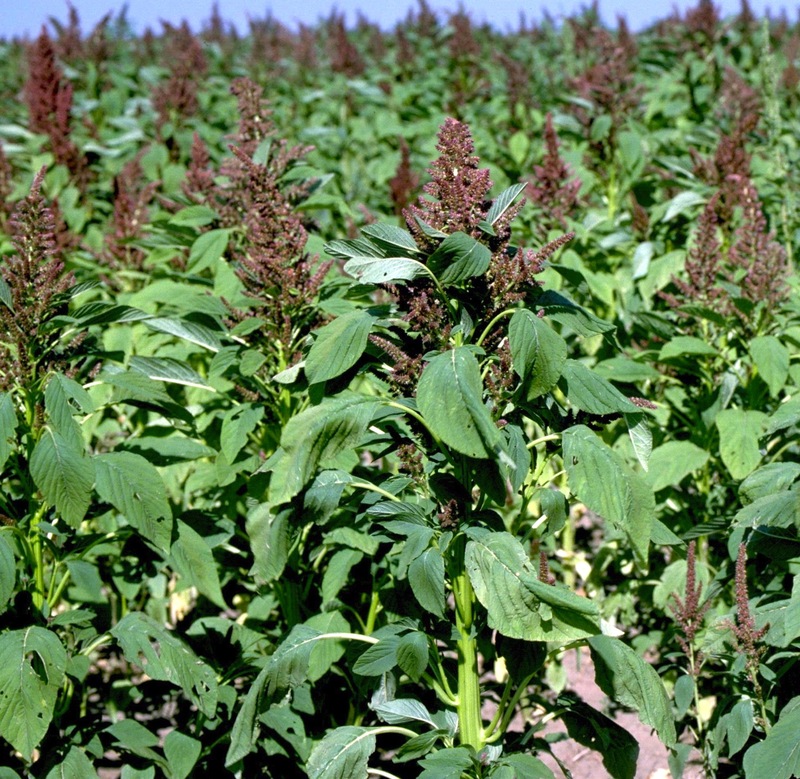 Pigweed can produce 10,000 seeds at a time, is drought-resistant, and has very diverse genetics. It can grow to three metres high and easily smother young cotton plants. According to the article 100, 000 acres in Georgia has been infestation with pigweed. 10,000 acres of production farm land were abandoned without harvesting. The only solution to this problem is hand weeding. Yes good old fashion handing weeding, and hand harvesting because machines can’t get into the fields. So much for the big ag advances in farming. This weeds stem is as thick as a baseball bat, and can lock up combines. But this is down south right? We are safe in Michigan, right? Wrong. There is pigweed in my backyard in Ann Arbor. I cannot say it is a roundup ready super weed, but since I do not use herbicide it does not matter. It is just another weed to pull. Perhaps our hard frosts may delay the migration of the super weed strain, but that seems like only a matter of time. Back to beets, most of the sugar beets grown to make Michigan beet sugar use gmo-roundup ready seed, and the accompanying roundup herbicide. The question is if this practice will/has already created a Michigan comparable super weed. Let hope not, but is there a back up plan if one develops? Are we ready to go organic, and hand weed? Has big ag bet all of their chips on roundup and gmo seed only to show us their cards to a losing hand? It certainly would appear so. After all, why buy roundup when you have to still go back in and hand weed, and hand harvest? Remember it will be a seven year wait until they figure it out, and by then maybe another super weed will show up to create a maddening endless cycle. OK. 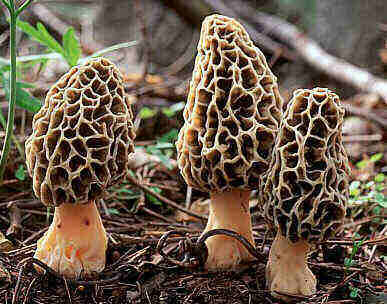 This is not a picture of Morels that I actually successfully hunted, and found. The place I search for morels was a bust again this year. Many, too many, people know about it. I scored a huge bag a few years ago, but since nothing. I found one morel stump after a few hours of searching. So I am finding a new spot. I am not sure where, but I am on quest this year to find a michigan morel this year. There are a few ways to grow mushrooms at home. The first is by finding a fresh hardwood log, drilling holes, and hammering inoculated plugs into the holes, and covering with wax. Another other way is to use the method shown here. Straw has been boiled (distilled), place in a bag, and then it is inoculated with a mushroom spore. In this case oyster mushrooms. Holes are poked into the bag, so mushrooms can grow through. I did not go through this process myself. I purchased this from a vendor at the Ann Arbor Farmers Market. The instructions were to put it inside in a dark area like in the basement, and make sure to keep it moist. This advise was well in good, but the house I live in has all wood floors, and I a lot of wood furniture. And for anyone who has tried to grow mushroom in the house, there is always the possibility that the mushrooms will decide to plant themselves on other carbon IE wood sources. So I am growing mine in a plastic tub in the garage. The vendor told me that I should get some mushrooms in a few weeks, and up to 3 more harvests. Sounds good to me. The leftover straw and mushrooms spore makes great compost. I will post updates in the weeks to come.